Dr. Sanchit is a very good and experienced doctor, he works very well with kids, my son had multiple issues with his Teeth and we had shown him to multiple dentists before DR. Sanchit, however none of them could do any treatment as like most kids my son was too afraid of letting any doctor work on his teeths. However with Dr. Sanchit he was comfortable right from the first visit, he also made us understand the full treatment procedure and set the correct expectations.I would easily recommend him to anyone. Dr Paul has a very positive attitude towards all the patients. Sanchit Paul has in depth knowledge and ensures that he explains the problem in detail. he did my invisible braces. One of my neighbour's recommended him. The overall atmosphere in the Tooth Tales is very soothing. All of sudden I developed this tooth pain and didn't know what to do. I consulted DrSanchit, He is quite knowledgeable and a known doctor in Noida. He treats his patients very patiently. And I am glad that I chose to consult him for my root canal treatment. I thank Dr Sanchit for the root canal treatment he provided. 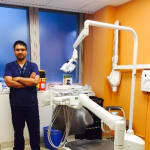 I must say that the Tooth tales clinic has all the amenities which patient requires.He is a well knowledgeable and experienced dentist and I am quite benefitted with his root canal treatment. My front tooth was broken for which I visited to Tooth tales clinic whwere I consulted Dr Sanchit Paul. He is extremely a knowledgeable doctor and he suggested an extraction treatment which benefitted me to great extent. 1. Focus on prevention than treatment. We see so many young kids as early as 2-3 years with facial swelling with all decayed teeth which can be life threatening in unfortunate circumstances. 2. Always keep a follow up after fillings and other treatment is done as children are bound to have recurrent infection and would probably sit on new/old infection. 3. Focus on getting the right treatment done then having denial and getting any "patchwork". It lead to bigger problems later. A checkup and followup with a child specialist will keep you away from any inadvertant situation. A big thank you for all the support and trust in our care till now. Please spread the word with your family and friends and refer so that they can get the best of guidance and care. With zeal of brining new tool to fight against the everlasting battle against Tooth decay, we bring in the SDF ( silver diamine fluoride). A great alternative for all those young ones who find conventional treatment difficult. Also, parents who are too apprehensive for fillings in early age, this is an excellent substitute. As rightly said, Interrupt to Intervene, Invest in your child's dental health now! Smile transformation for a young 4 year old. Full mouth rehabilitation with tooth colored metal free crowns. She might have come in with no memories of healthy teeth, but not only walks out with new smile but new confidence for outside world. Book appointement at +919717106083 or visit www.toothtales.in and give your child a new smile and confidence. New Hassle Free Way For Your child's Healthy Smile. For the ease and convenience of you, recently we have launched mPOS facility for financial transactions. You would also be glad to learn that it comes along with financing/EMI facility of duration as per your choice. So, avail this new hassle free opportunity and let your child be beneficiary of it. Chief Pediatric Dentist & Owner Tooth Tales dental clinic. New Hassle Free Ways For Your Child's Smile. This Summer, Gift your child a healthy Smile. Common Tooth Injuries for Children: First Aid For it! A chipped or knocked out tooth can be a very painful condition. Tooth injuries are most often caused during a sports activity or when your child take a nasty fall. And such accidents can hamper children's general well-being, their ability to enjoy food, appearance and their precious smile. Collect your broken tooth: Carefully collect the tooth fragments to not cause any additional damage which may prevent re-implantation. Avoid touching the root part of the tooth. Wash it gently in lukewarm water and keep it in a small bowl of milk. Avoid scrubbing or scraping to remove dirt. Reinsert your teeth if possible: Once you rinse the teeth, try to reinsert your hild's teeth in the socket. This may be a painful exercise, so proceed only if you think your child can bear through it. You can store it between your cheek and gum to prevent drying or in a bowl of whole milk. Take care of your child : If there is bleeding, give your child's mouth a good rinse to clear off the blood that is blocking the view. Identify the source of bleeding and press in with a sterile gauze or cloth. Give your child a treat: This is a great way to get their mind off the pain and works wonders for children. Treat them with an ice lolly/ frozen pop to ease out the pain. If there is any cut on their gums or lips, another equally tasty home remedy is to cover it with sugar which will temporarily stop the bleeding and the sweetness will help them to forget the pain for the time being. Go to a child's dentist at earliest: Even if it is a minor chip, it is always advisable to see a dentist at the earliest, as the cut may be sharp and can eventually end up hurting your tongue. The sooner , the better it is. Your children's teeth need to last their lifetime, so take good care of them, especially when faced with an injury. If you wish to discuss about any specific problem, you can consult your child's dentist.